Could the Boston Bruins be the front-runners for Russian free agent and former NHL superstar Ilya Kovalchuk? Evidently, the Sports Hub’s Ty Anderson thinks so. As reported by NBC Sports, Anderson appeared on Toucher & Rich on 98.5 and said he believes the Bruins are currently the leading candidates to get the 35-year-old winger due to the Bruins cap space. While the Bruins are listed by CapFriendly as having just $6.5MM in available cap space, the team has few free agents of their own to deal with and a loaded roster, including multiple talented veterans such as Brad Marchand and Patrice Bergeron and a core of youth of which many had solid rookie years last season. Kovalchuk, who tallied 31 goals for SKA St. Petersburg in the KHL has been touring NHL cities, looking for a new home. While his preference has been to stay on the East Coast, especially either New York or Florida, he’s broadened his search this year including a trip to Los Angeles and San Jose as he’s made it clear that he wants to win a Stanley Cup as soon as possible. 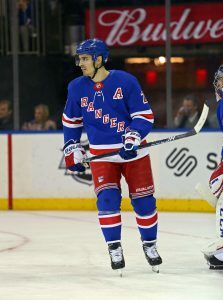 While the New York Rangers are looking for defense, the New York Post’s Larry Brooks writes that veteran defenseman Brendan Smith has stayed in New York following the season and has been working with fitness trainer with Ben Prentiss to get into better shape. 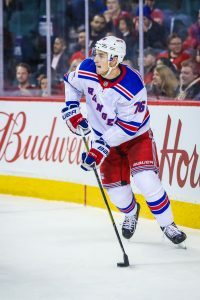 Smith, who was placed on waivers on Feb. 9, after signing a four-year, $17.4MM contract in the offseason, came into camp out of shape and struggled on the Rangers’ blueline all season long. The scribe writes that the Rangers not only expect him to compete for a job at training camp, but they expect him to return to the status of the player they handed that contract to. Helene St. James of the Detroit Free Press writes she believes it looks promising that 2017 first-round pick Michael Rasmussen makes the Detroit Red Wings team out of training camp this year. The ninth-overall pick last year put up 31 goals and 58 points for the Tri-City Americans of the WHL and even got some time at the wing position during the season because Detroit would likely like for him to start at the wing if he makes the team next season. What’s more impressive is that he scored 16 goals and 33 points in just 14 playoff games, suggesting he might be ready for Detroit. If he doesn’t make the team, he will have to return for one more year to Tri-City. Before the 2018-19 season even begins, there will be some conflict between divisional foes. The Montreal Canadiens and Detroit Red Wings are both coming off disappointing seasons and are looking to reinforce their franchises with their own high draft slots as well as acquired picks. Both teams are hoping to cash in on several picks in the first and second rounds to find multiple players that will grow to become regular NHLers. However, they may have to battle each other to do so. The Athletic’s Craig Custance published an article this week about Detroit’s possible plans and potential targets for a trio of picks in the 30’s. His colleague Arpon Basu was quick to respond with his own article about Montreal’s potential marks with their two picks in the early second round. Basu also added that the two teams share similar organizational needs. Among them, both the Canadiens and Red Wings could use a top-flight center and defenseman in the pipeline. With no suitable centers available when either team picks in the first round – the Habs at #3 and the Wings at #6 – what those teams do early on could dictate their priorities in the early second. Many expect that Montreal cannot pass up the elite forward talent that is winger Filip Zadina. The Canadiens (or Red Wings) could reach for center Jesperi Kotkaniemi, but it is unlikely. They could also take a defenseman, as there are plenty of supremely talented names available in this draft. After Rasmus Dahlin presumably goes first overall, most consider Quinn Hughes to be the next best name. Of course, Detroit is the heavy favorite to take the University of Michigan product if he’s still on the board. If Montreal chose to steal him, it would be the first conflict between these two teams. Things heat up even more later on though. Detroit has a second first-rounder at #30, courtesy of the Tomas Tatar trade with the Vegas Golden Knights. While this is a prime position for the Wings to trade out of, they could also simply make the pick. It is here that the Red Wings could beat the Canadiens to one of the top available centers. Both Custance and Basu list Ty Dellandrea as a prime target in the late first and early second, and Basu also offers Isac Lundestrom and Jacob Olofsson as candidates if either is still available. Then, in the second, Detroit picks again at #33, the pick they received from the Ottawa Senators through the New York Rangers in the Brendan Smith deal. So while the Habs get the first shot at selecting ahead of the Wings early in the first round, Detroit then has the next three consecutive picks ahead of Montreal. Here, it would be easy to see the Red Wings double up on defensemen, aiming for a more physical specimen. Both Custance and Basu tab K’Andre Miller as a likely target, while Basu also lists Mattias Samuelsson and, if he’s still there, Jared McIsaac. Both writers are also intrigued by the boom-or-bust talent of defenseman Ryan Merkley, another swift puck-mover like Hughes. Don’t rule out Detroit looking his way as well. Finally, Montreal gets their next shot at #35 and Detroit picks right after at #36. Montreal may again have to pick up the scraps at #38, the selection they landed from the Chicago Blackhawks along with Phillip Danault in the very favorable Tomas Fleischmann/Dale Weise trade in 2016. Montreal also has picks #56 and #62 later in the second round, leaving open a very real opportunity that they could change this whole dynamic by packaging multiple second-rounders – in a draft that many feel is homogeneous in the #20 to #60 range – to move back into the first round and ahead of Detroit at #30. It would then be the Canadiens who could take the best available center or defenseman and put the Red Wings in a tough spot. It’s always a good time to see two Original Six teams battle on the ice, but the war for position brewing between Detroit and Montreal in the upcoming draft could be just as fun to watch. Brendan Smith signed a four-year, $17.4MM contract in the offseason with the New York Rangers after an impressive run last season, but hasn’t been anything close to what the team had hoped for. After struggling through 44 games with the team, he was eventually waived and sent to the minor leagues to toil with the Hartford Wolf Pack despite his huge salary. That might have built some frustration in the 29-year old, who according to Larry Brooks of the New York Post has broken his hand while fighting teammate Vinni Lettieri in practice on Sunday. That puts an end to Smith’s season, and perhaps his career in New York if the team decides a buyout is the only course of action. Brayden Schenn will not face any supplementary discipline for his hit last night on Boston Bruins forward David Krejci, despite his history of charging in the league. Schenn was given a two-minute minor penalty for the hit which had substantial—but according to the league unavoidable—contact to the head. The St. Louis Blues forward has been suspended twice in the past for charging, but escaped without further penalty this time. Patrik Laine suffered just a bruise to his foot after blocking a shot, but the Jets are still going to be precaucious with their superstar teenager. Laine isn’t expected to play for at least the next two games, and Ken Wiebe of the Winnipeg Sun gives a rough estimate of 4-14 days before he’ll be back in the lineup. Laine is in a race for the Maurice Richard trophy as the league’s leading goal scorer, but is a key part of the Jets chances to take home the Stanley Cup. Braden Holtby has tweaked something and is dealing with a minor injury, meaning the Washington Capitals have called up Pheonix Copley to back up Philip Grubauer tonight. Holtby isn’t expected to miss much time though, as he didn’t even leave practice today according to Isabelle Khurshudyan of the Washington Post. Copley was re-acquired as part of the Kevin Shattenkirk deal last season, but hasn’t played for the Capitals yet this year.